The smallest arrival this year and from the lower end of the range arrives a NEW SC26. Having recently had a face lift, this little craft has come of age. With small cabin, Toilet and lots of deck seating this SC26 will soon be seen out on the water captained by her Singapore based owners who is coming to Phuket monthly to use their new boat. Weekends are already being spent out at the many popular anchorages in the area. Her owners take advantage of Go Boatings management contracts, which include cleaning and total vessel management, right down to taking care of the laundry. Powered by twin 140hp Suzuki’s this striking looking 26 easily reaches 41kts and cruises with minimal fuel burn. 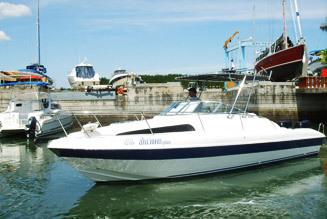 This is a perfect starter package and easily gets her owners out on the water, to enjoy the lifestyle. Once familiar with boating, an upgrade to a 33, 34 or 36 is possible using Go Boatings “buy pack” scheme. Check out this lovely boat located in RPM Phuket.